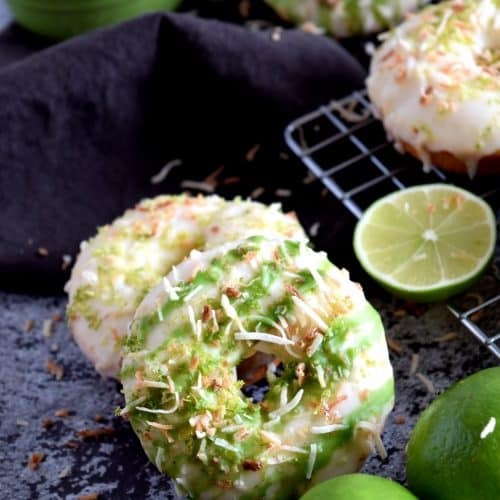 Super citrus-y Glazed Lime Donuts with Toasted Coconut will have your puckering your lips and begging for more! All of the other donuts are green with envy! Next, beat in the butter, vegetable oil, 1 teaspoon of the lime zest, and lime juice. Bake for 10 minutes. Remove from oven and transfer to a wire cooling rack to cool. Repeat until all batter is used. While the donuts are cooling, add the coconut to a skillet and heat over medium-low heat, stirring consistently, until nicely browned. The coconut will burn quickly, do not leave unattended. Once the coconut is brown, pour into a bowl to prevent further browning from the hot skillet. Next, whisk together the confectioner's sugar and lime juice until the icing is smooth and consistent. For a thicker icing, add more confectioner's sugar. For a thinner icing, add about 1/2 teaspoon of lime juice at a time. Dip the donut, top side down, into the icing. Lightly shake the excess icing off the donut, or gently drag the iced part of the donut over the rim of the icing bowl. Place the donut, iced side up, back onto the wire cooling rack. Sprinkle the toasted coconut over the top of each donut while the icing is still wet. Next, top with some fresh lime zest (optional). Allow donuts to sit until icing has hardened. If you want to add a green drizzle on top, take a few tablespoons of the glaze and add a little drop of food colouring. Mix well and place in a Ziploc bag. Cut a small hole in the tip and drizzle the icing over the prepared donuts. I used Wilton Moss icing colour gel.